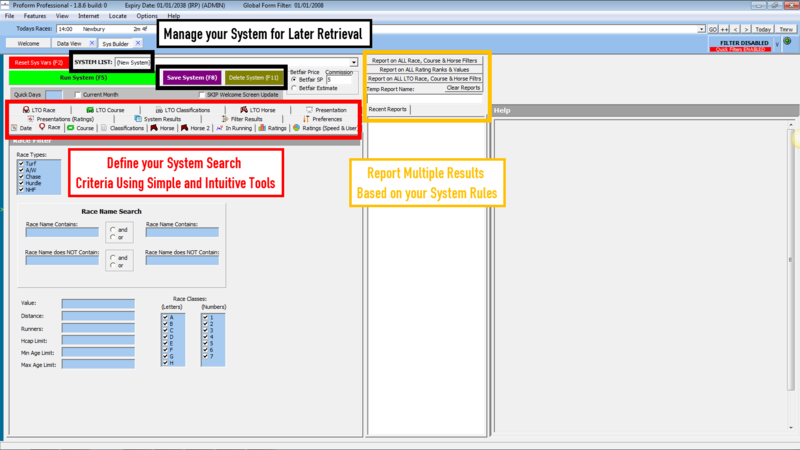 Proform v1.91 is full of enhancements you’ll appreciate every day. There are some exciting new features in the new version, not least, the ability to query and build systems around best odds guaranteed bookmaker prices at three different price points. Evening, breakfast and morning prices. This exciting new feature is a game changer in our opinion. • We have added bookmaker prices at three points in time before a race. • 8.30pm night before (called EVENING Price). • 7.30am in the morning (called BREAKFAST Price). • 10.30am in the morning (called MORNING Price). • They are not best price, although of course sometimes they will be. If you wish to read our full release notes for this version then click here to download the PDF. Welcome to Proform Racing; the only all-in-one horse racing software that has been the professionals choice since 1995. If you’re looking for a powerful horse racing form book, statistics, dynamic speed and form ratings and tissue prices then there is only one computer form database and research tool you should be using. Proform is the choice of many TV horse racing pundits, professional punters and hobbyists, plus we provide racing statistics to many leading industry specialists. Our professional form book has earned a reputation second to none, that’s why well known tipsters to TV pundits rely on our form book to pinpoint betting opportunities. 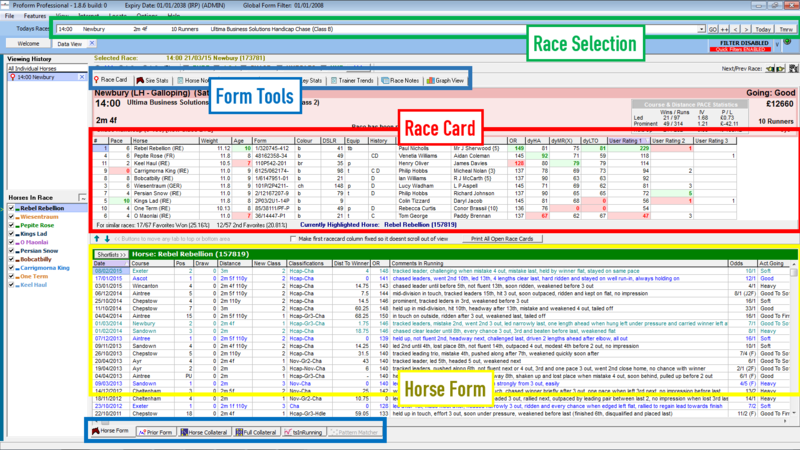 Proform Racing is a powerful horse racing form guide and research tool that runs on your windows computer (or a Mac running Windows). Our Software provides the ultimate in horseracing data and research tools which means you have a unique edge over 99% of punters who are not using our information. Have you ever wished you had the foresight to identify profitable systems and angles before the race? This and many more questions are answered by the Proform System Builder which uses innovative tools that let you develop and test strategies and systems. So you don’t miss those big priced winners Proform will also notify you when horses matching your criteria are running. 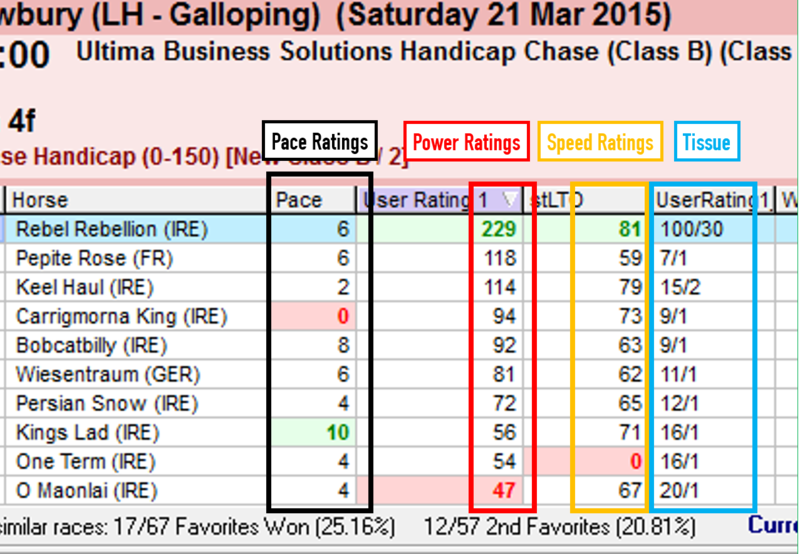 On average finds the winner 60% of the time from our top 3 Power Rated Horses! As part of your subscription you will get access to Proform’s powerful ratings and tissue prices for all UK and Irish races. Like humans, horses have likes and dislikes and when racing on the same conditions that have proven to be successful in the past they it’s a fair chance they will run well again. These hidden patterns can be exposed easily using our Pattern Matcher which forms part of our excellent form analysis tools. Click here to find out more about our Pattern Matcher feature. Trainers are creatures of habit and when they have found a winning formula they stick with it! Using our Trainer Trends Tools, you can identify the where the trainer shines and under which conditions for instance when racing their horses at a specific course, over a certain distance, teaming up with a particular jockey, racing in a specific race type. Our Tools Make In Running Betting Easy. Find back to lay bets. Find lay to back bets. Find which courses favour low priced horses getting beaten. Analyse betting using a low in running price against 1000′s of parameters plus much more. If you want to learn more about our In Running Tools, take a moment to watch this video which forms part of our comprehensive suite of training videos. 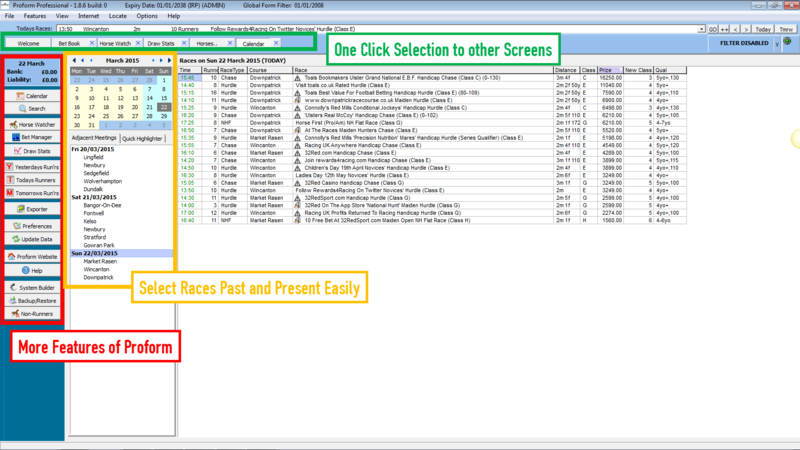 Import your own Race/Horse Notes and Ratings or customise each screen to suit your preferences. Whatever your needs are, Proform provides instant access to powerful tools to give you the edge. Once you have installed and registered Proform we will also during the life of your subscription period give you access to detailed training material and technical support to help you though the learning curve, along with additional member resources.